I love honey, lemon and ginger hot drink. I have it quite often with or without a cold. This combination also works for a Chinese style sweet and sour. Here is the recipe for this simple fried fish with honey lemon and ginger sauce. Cut fish into bite size pieces. Mix with soy sauce, ground pepper, cornflour and plain flour. Prepare the sauce. Mix everything together. Heat oil till medium hot. Mix beaten egg gently without stirring much to coat the fish pieces. Drop fish pieces into hot oil and fry till golden brown. Fry the fish in several batches. Drain on paper towel to absorb excess oil. To keep the fish batter crispy warm in the oven at medium heat. When all the fish pieces are fried. Remove oil and clean wok. Heat the sauce without any oil till thicken, add fish pieces stir quickly to coat with sauce. Trip to the fishmonger is required I think - this looks great! Lovely!! 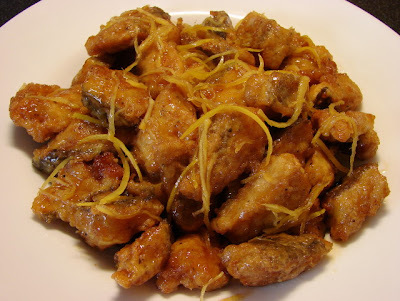 I love fish ...will get some from Jerudong and try this recipe out. Thanks. God bless.